The chairman of the Buncombe County, North Carolina Republican Party called out Asheville City Schools for “liberal institutional bias” and “tolerated discrimination” against conservative students, a report said. 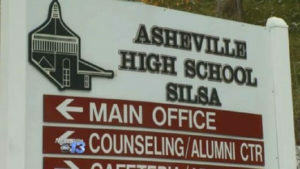 In a March 14 report, WorldTribune.com noted that some parents of Asheville students were critical of alleged liberal bias in the school system. “We have arranged for the UNC-A College Republican’s Club to serve as potential mentors for conservative minded students at Asheville High and would appreciate your help in creating a safe and functional bridge to help actualize that support system. “We would like to explore opportunities for expanding the opportunities for conservative-minded students at Asheville High to cultivate, express and otherwise explore their value system within the parameters of the school’s stated mission and guidelines. “We would appreciate your help in identifying a safe process for students and/or parents to address their concerns about bias or abuse without fear of being stigmatized, penalized or otherwise mistreated by the administration, teachers or students within the system.